As the country reflects upon the outcome of the Scottish independence referendum, I thought it would germane to consider one of the county’s most fascinating holy well especially being near a contentious battle of course! 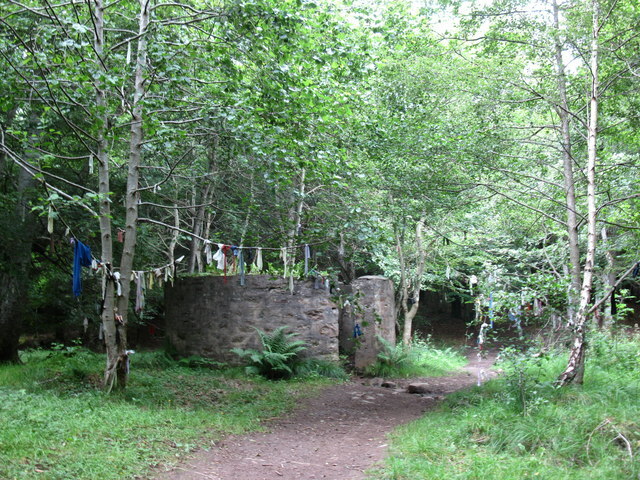 Enclosed in a woodland settling is one of Scotland’s greatest clootie well, Tobar na Coille often called St. Mary’s Well, but translated means the well of the wood. It’s position not far from the battle site of Culloden resulted in it becoming called the Culloden Well. Indeed it appears to have even more names – The Blue Well and the Tobar n’Oige of the Well of Youth. Surely, a significant site. The fabric is unusual as well. It arises in a 18” diameter and 24” deep chamber which is surrounded by a circular building, more like a circular animal pound or dare I say it a urinal. Why the arrangement? Is it to protect the visitors from the vagaries of the spring, prevent animals entering or perhaps protect the decency of anyone who would bath here. However, that later idea is not supported by similar wells elsewhere and the spring is not big enough for a dip I feel. St Mary’s Well, Culloden © Copyright Jim Thomson and licensed for reuse under this Creative Commons Licence. Not far from the well was a Chapel to St Mary, whose only remembrance being the local farm, Chapelton Farm, Balloch. As a site is did not survive the 1746 battle and nothing can be traced on the ground. It is possible that a spring of water near the old chapel was the original St Mary’s well and after the battle it was moved to this spring. This would explain the name changes perhaps and it has only recently become a true holy well. This sadly continues, but there is evidence of traditional fabric. 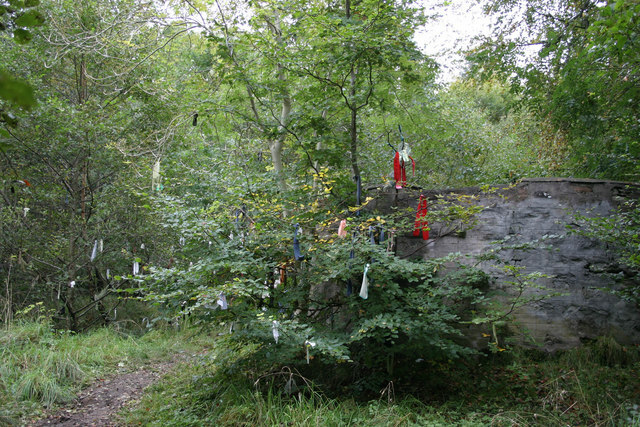 The day to go to the well was the first Sunday in May, which underlines the association of the site with the old Pagan Celtic tradition of Beltaine. A visit on May day would reveal wine! Morris and Morris (1980) inform us that in the 1930s as a many as a dozen buses were running from Inverness to carry visitors to the spot, who would drop coins and several pounds were recovered from the well and given to charity. Four thousand in all…today some come but not as many. However, even in the 1940s the Inverness Courier reported that on the first Sunday of May six Cameron Highland, wished over a well in a Tunisian olive grow as they tied their cloots that they be back at St. Mary’s Culloden. They survived the War and did meet! Such large crowds attracted the wrong sorts and stories of debauchery were spread by the papers and the more intolerant members of the Kirk. Interestingly, it is said that the well or chapel gained its name from the belief that Mary herself lived in the area and administered to the sick. This may be based on the idea of a local ‘priestess’ who would stay at the well and help visitors…or more likely a way of endorsing this either Pagan or commercial enterprise. If the real St Mary’s Well lies elsewhere, what can we say of this one. Clearly the name, Tobar n’Oige is not far from Tír na nÓg, well of the dead. This is significant because Beltaine was one of the times where the wraths and spirits could be seen and the gates to the afterlife were open. Or does it refer to the battle not far away? There is a well nearer the battle site which does bear the name, Well of the dead. Did this gain the name when the other adopted St. Mary, or does this suggest a strong Beltaine tradition in the area. The obvious explanation is that this is associated with the battle but that may be coincidental? All in all in its woodland setting and especially seen on a misty spring day..St Mary’s Well is one of the country’s most romantic sites. One wonders what witness to the strife of Culloden it saw..thankfully we can discuss such matters with democracy. St Mary’s Well, Culloden © Copyright don cload and licensed for reuse under this Creative Commons Licence.